The “medical mistake rate” is estimated to be approximately 10%. This applies to all doctors—even the very best. A colleague from Boston recently developed severe malaise and a low grade fever after staying in a damp old house. She experienced severe weakness, neck stiffness and headaches for two weeks. After “self-treating” for two weeks with little result, she asked specialist colleagues for their opinion. No good ideas from multiple specialists. My colleague thought some bed rest would help, but none of her colleagues could cover her patients. She then experienced double vision. A neurologist was consulted who suggested (only) an MRA of the brain to exclude aneurysm. My colleague’s complaints of headaches and neck stiffness were disregarded. Her daughter (an attorney) did a Google search which actually provided better results than all the doctors consulted. Lyme Disease . . . or something linked to it. This is an important consideration in Delaware—Lyme is endemic. Given the symptoms, the radiologist looked at the history and conditions being evaluated and added an MRI of the brain with and without contrast. This ended up saving the doctor’s life. If the original order had been followed, no meaningful result would have been seen. An MRA does not actually “see” the brain. It looks only at the blood vessels to the brain. It does not evaluate the internal structures. 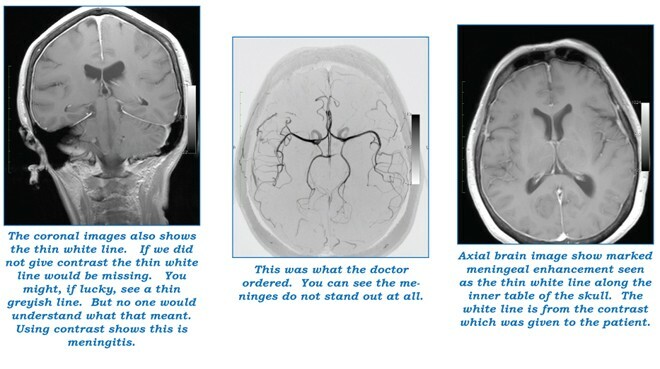 The MRI with and without contrast, performed at MRI Consultants, confirmed a diagnosis of Lyme’s meningitis! contrasts are known to build up in the body over time. Typically, these are older forms or less stable forms. We have been a proponent of using the safest contrasts available since 2007. Incidentally, had we failed to use contrast, we would not have been able to observe the change it made in how we “saw” the lining of the brain (the meninges). Again, the error rate in medicine is approximately 10%. One way to help avoid mistakes is to review as much of a patients medical history as possible at every decision point. Dr. Chao does this for free when asked by any physician or his patient. We highly recommend you bring copies of imaging done elsewhere with you when you come to our facility. Dr. Chao is then able to compare and note possible changes. Technology has become so complicated that a medical consult for advice should be done before procedures are ordered. Also, as noted above, the way a test is ordered (whether contrast is used or whether the study, as ordered, can generate the information required) is of critical importance. Ordering a test properly is of great importance, but it is also important that the patient be able to remain still during the test. There is some software that helps us correct for slight blurring due to movement, but we understand that an anxious patient may simply be unable to remain still. For these people—and the very claustrophobic—we offer IV Sedation. It costs extra, but it can make the difference between getting a good image and blurry one. Call our office to inquire. 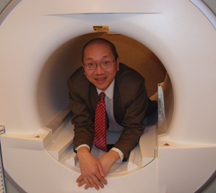 Providing this level of care and quality is the reason MRI Consultants opened its doors in 2007, with Delaware’s first 3T MRI scanner and Dr. Chao’s more than 30 years of experience. We are here to save lives. 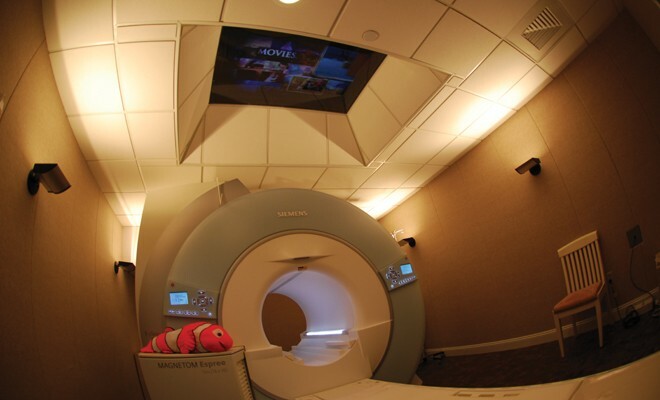 In addition to being dedicated to providing the best quality MRI studies possible, I wish to let everyone know about something which can save even more lives. As you know, stroke is one of the leading causes of death. It affects 20% of us. It causes severe prolonged morbidity. There is now a proven technology which can cure 35% of stroke victims! While this is currently available in New Castle County, it is not yet available in Kent or Sussex counties. The delay of even 30 minutes (the time of a helicopter to a different hospital) causes an increase in stroke and mortality. Time is brain. Look up STENT RETRIEVER TRIALS on the internet. Call Dr. Chao if you have questions and feel free to contact local hospitals or even politicians to help make this important technology available. A final word about something that affects 50% of us. Heart disease is the leading cause of death in this country. A cardiac surgeon taught me years ago that the amount of atherosclerosis of the aorta reflects on the smaller arteries. A paper published in 2013 directly found that aortic wall intimal thickness is related to your risk of dying from a cardiac event. Spread the word, a good MRI can give advance warning of heart attacks.